Chaguanas bus accident victim Khemraj Ramgohan at the Eric Williams Medical Sciences Complex last week. One day after he complained about poor treatment at Eric Williams Medical Sciences Complex (EWMSC), Mt Hope, bus accident victim Khemraj Ramgohan has been sent home. 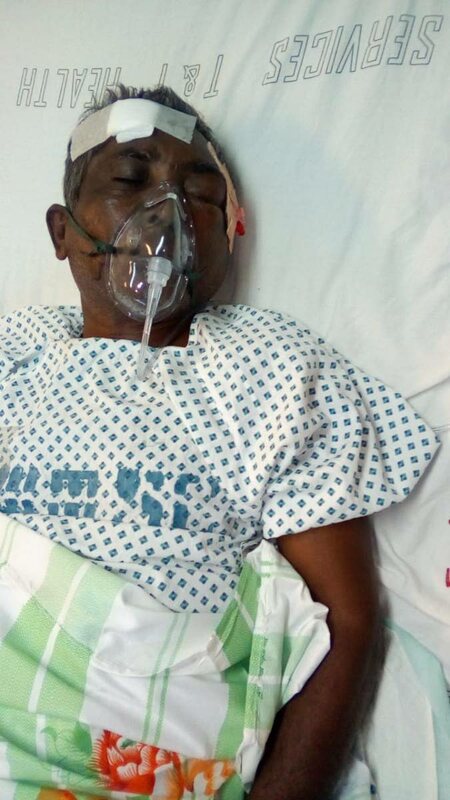 Ramgohan, 62, was discharged on Friday, however, because he was in a lot of pain he sought medical assistance at San Fernando General Hospital (SFGH) where he was treated in the accident and emergency (A&E) department, admitted to a ward and kept overnight. He was discharged from the SFGH yesterday with a referral letter to attend the eye clinic on Tuesday. Ramgohan was one of 50 passengers travelling on the Public Transport Service Corporation (PTSC) bus last Tuesday when it was struck by a Blue Waters delivery truck, which had been hit by a garbage truck, on the Uriah Butler Highway, Chaguanas. Police said the garbage truck blew a tyre, struck the delivery truck which crossed the median and struck the bus travelling on the north-bound lane of the highway. Two bus passengers, Tara Baboolal, of Penal and Judy Reid-Clarke, of Diego Martin, died. Baboolal was almost decapitated by a flying piece of metal. Another sharp piece struck Reid in the chest, killing her instantly. The other 48 passengers were all injured. Based on their injuries, the more severe cases were sent to the EWMSC and the less critical to the Chaguanas District Hospital. Forty-five of them were treated and discharged within a 48-hour period. Ramgohan and three others were warded at the EWMSC. The resident of Rousillac Village, south Trinidad, suffered cuts to his forehead, face and arms. Pieces of glass are still lodged in parts of his body and his eyes are swollen shut. In an interview with Newsday on Friday, Ramgohan’s wife Chanrowtee Jairam said he was not getting the kind of treatment he expected. She appealed for help saying no information was forthcoming from the doctors, about his medical condition. Ramgohan was on his way to work at the Ministry of Legal Affairs when he was injured. He said he usually parked his car in San Fernando and travelled to Port of Spain with the bus. Reply to "Bus crash survivor sent home from hospital"